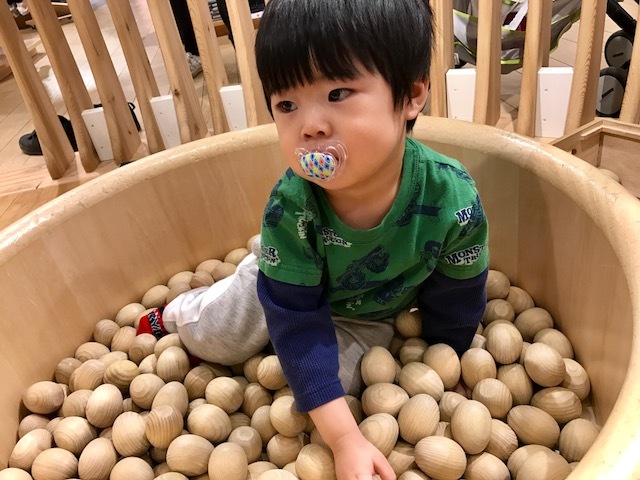 When looking for children’s activities in Tokyo, I stumbled upon this blog post from Roam The Gnome about the Muji Shibuya store playroom for kids. Muji is a Japanese retailer that sells various housewares, clothing, and other consumer goods. They also cater to families with children. 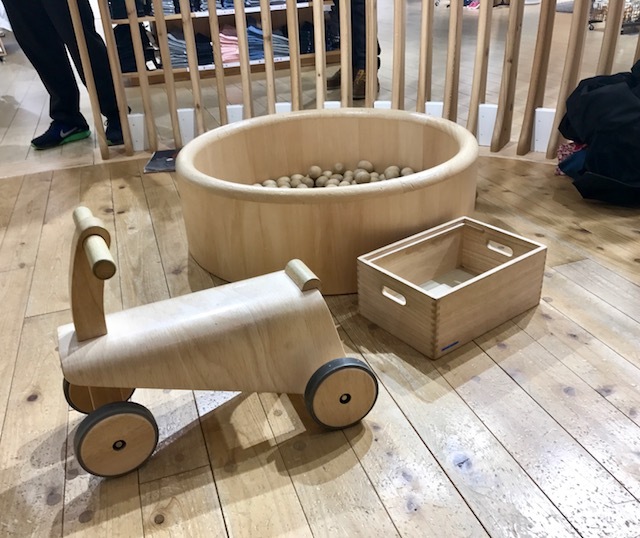 The 5th floor of the Shibuya Muji store has a special children’s play area. This fun little area has wooden décor that gives off a very soothing and peaceful vibe. The whole play area is filled with all sorts of wooden toys. There are wooden animal magnets, rocking horses, ramps, as well as a wooden egg ball pit. The little tables and chairs are all made of wood as well. Our son loved stacking all of the wooden figurines and rolling around in the wooden ball pit. 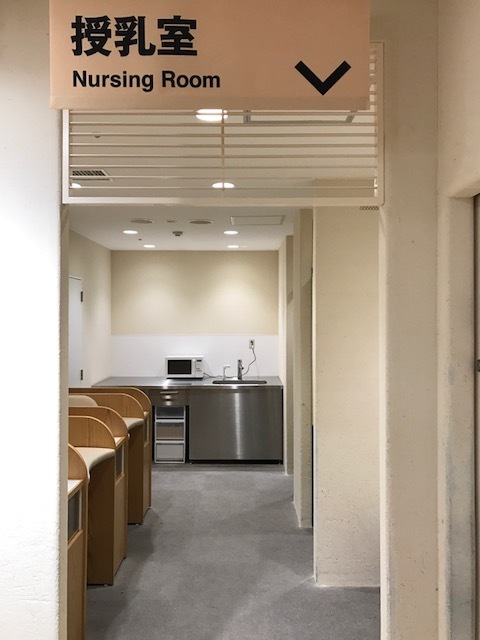 There is a nursing area with baby changing tables right next to the play area. We grabbed lunch at the Daylight Kitchen, a short walk from the Shibuya Station and one of the most child friendly restaurants around Shibuya. Here they serve fresh and healthy organic food. The restaurant has indoor and outdoor seating in a peaceful atmosphere. Daylight Kitchen was one of the very few restaurants we visited in Japan that provided high chairs for our son. We ordered the chicken set meal. The chicken was sautéed with vegetables and included 3 sides (no idea what they were but it was tasty). Our meals included organic salad, barley rice, and miso soup. Everything tasted great and was much healthier than anything we had eaten in Japan up to this point. Our next stop was a visit to the Tokyo Station, one of the busiest stations in Japan. Tokyo Station was recently renovated in 2012 with beautiful construction inside and out. The station has many underground passageways filled with shops and restaurants. You can easily spend half a day just exploring all the stores the station has to offer. The outside of Tokyo Station is built with red bricks and a clean design, dating back to 1914. The station is located in a business district, surrounded by skyscrapers and tall buildings. The Imperial Palace is the residence of the Emperor of Japan. Gardens, trees, moats and walls surround the palace. A bridge leads to the main gate of the palace. Unfortunately, the palace grounds were closed on the day we visited so we could only admire the palace from a distance. Still, it was fun and peaceful exploring the outer gardens with the palace in the background. After exploring the outer grounds of the Imperial Palace, we made the 5-minute walk back to Tokyo Station for dinner at Tokyo Ramen Street. We enjoyed the ramen at Tokyo Station so much the last time we went to visit Tokyo that we went there for dinner on two separate occasions. This little corner of the station has 8 of the best ramen restaurants in Tokyo all lined up side by side. It can be hard to decide which ramen restaurant to visit with so many good options! We came early and since it was off peak season, there weren't any long lines. We found a restaurant we all agreed on and ordered from the vending machine prior to being seated. As expected, the ramen was very flavorful and filling. Locals and tourists flock to Ramen Street to grub on steaming bowls of delicious ramen. You can read a nice summary of all the various ramen options on the Tokyo Cheapo website here. After dinner, we all agreed that we had seen enough of Tokyo and were ready to head out to Osaka the next morning.